A review in 10 words (or thereabouts): A reality show that turns heroes (and would-be heroes) into celebrities. Superpowered humans known as NEXT appeared in the world 45 years ago. Some of them fight crime in the city of Stern Bild while promoting their corporate sponsors on the hit show “HERO TV.” The people love their superheroes, even if they don’t completely understand them, and not all of the NEXT use their powers for good. I must be in movie mode, because every book I read seems to remind me of cult classics. Well...in this instance "classic" might be pushing it, but it's a classic in my household. 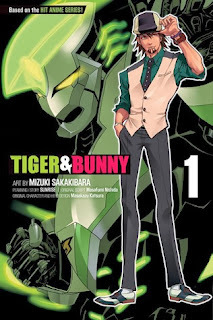 Tiger & Bunny depicts a world of superheroes...and reality TV. A media company has purchased the rights to the superhero "franchise" of sorts. When evil strikes the town, the heroes are dispatched and earn points for capturing the villain. Tiger is just about the worst superhero ever, and his new partner Barnaby, a.k.a Bunny, thinks he's the best thing since sliced bread. Have you ever seen Running Man starring Arnold Schwarzenegger? He's a criminal who is let out of prison and placed into a reality TV show where super villains earn points for killing off participants. While, at first glance, Running Man and Tiger & Bunny seem opposites, they're also a bit the same. Each hero has a quirk, something that makes them popular. Viewers tune in at home and in public spaces to cheer on their favorite regulars. And media is deplorably power hungry and care more about ratings than the common good. Same here, the books I read play out as movies in my head. It has taken some time for me to adjust to the different formats of manga/graphic novels/comic books. I think what amazes me the most are certain authors and illustrators who can use so few words but create a riveting story. Not everyone can do it! Manga was a lot of trial and error for me, but I'm finally finding myself enjoying them a bit!